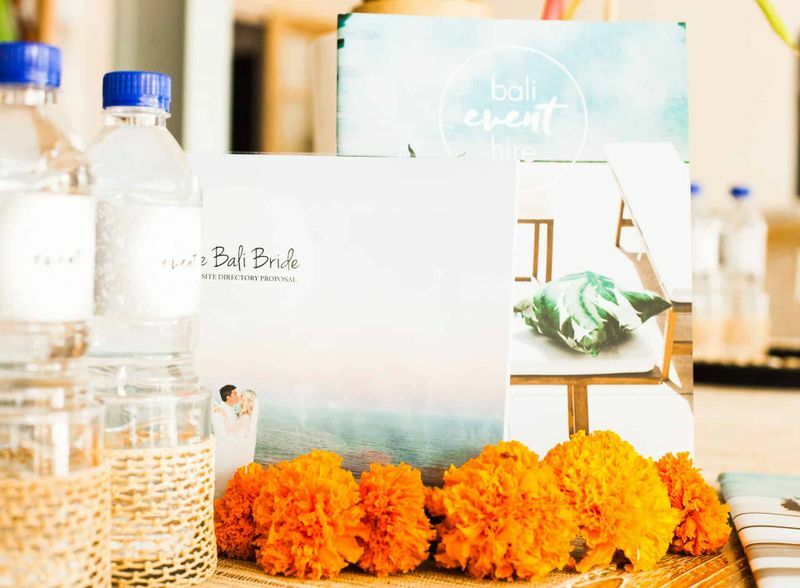 The Bali Bride Team recently sat down with Bali Event Hire to talk all things furniture, weddings and their amazing team. 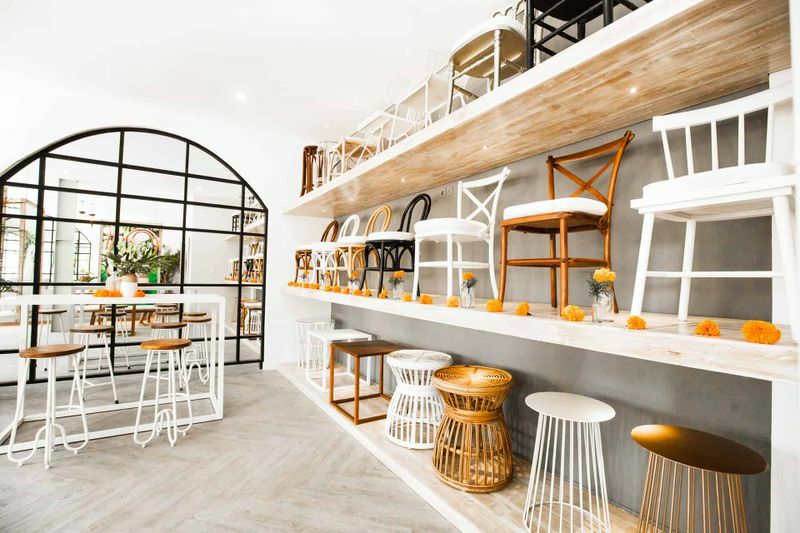 With a focus on everything being ‘Made in Indonesia’ and the exciting launch of their brand new showroom, Vanessa & Sarah from BEH just oozed style and passion talking why its so important to support the local Balinese in their business model. 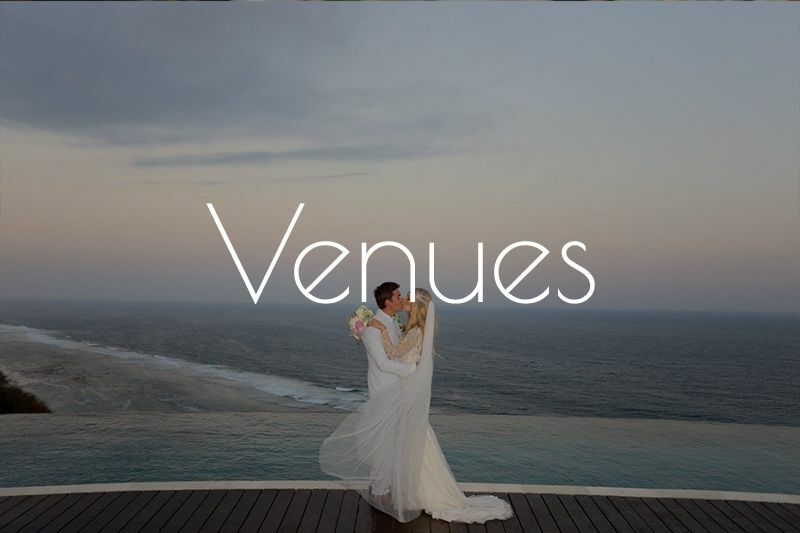 Set in their new showroom in Canggu which they open for brides to visit with planners and stylists. 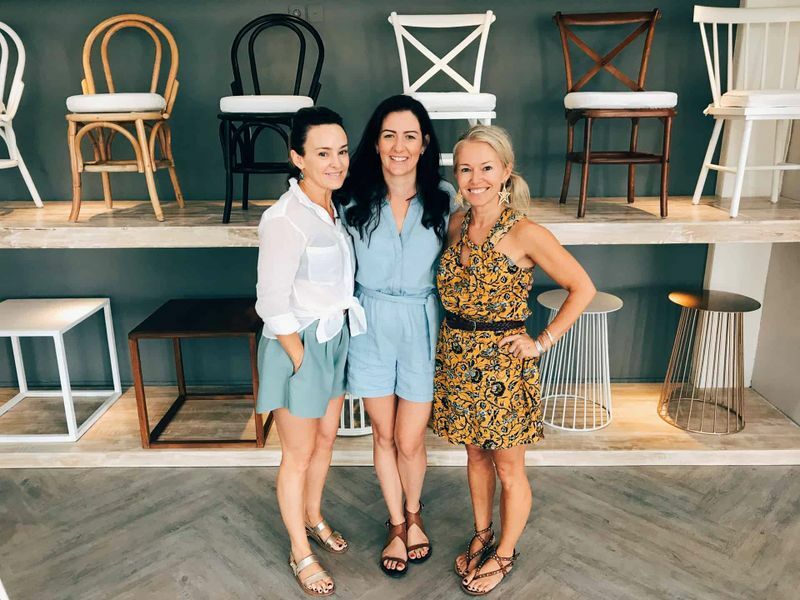 Its filled with beautiful, on-trend furniture and gorgeous, giant prints of their previous weddings, you can tell by talking with them in person how much they love what they do. Take a look below to see inside their new showroom, behind the scenes in their factory and the team. 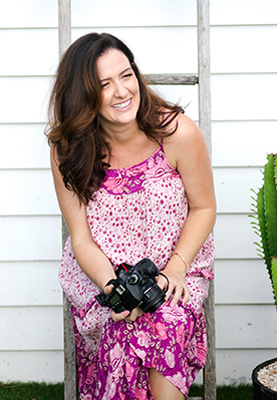 Tell us a little about yourselves…..
We’re young mums and best friends from Melbourne with this incredible dream job running Bali Event Hire! 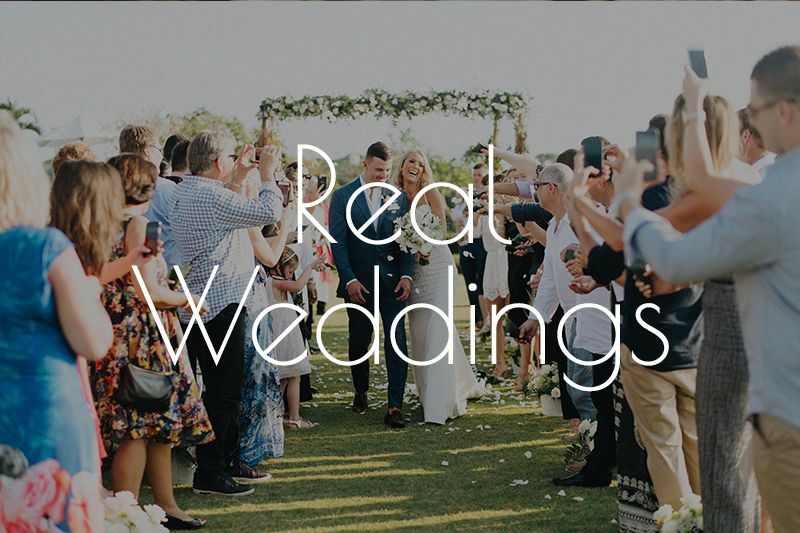 We split our time between Melbourne and Bali and have the best time ever working with our incredible Bali team, our clients and our couples making weddings on this magical little island the most beautiful they can be! What drew you to Bali? The energy, the culture, the people, the weather, the food, the margaritas, the yoga – the list is endless. Sarah and I have been coming to Bali for 20 years, it’s our second home now. 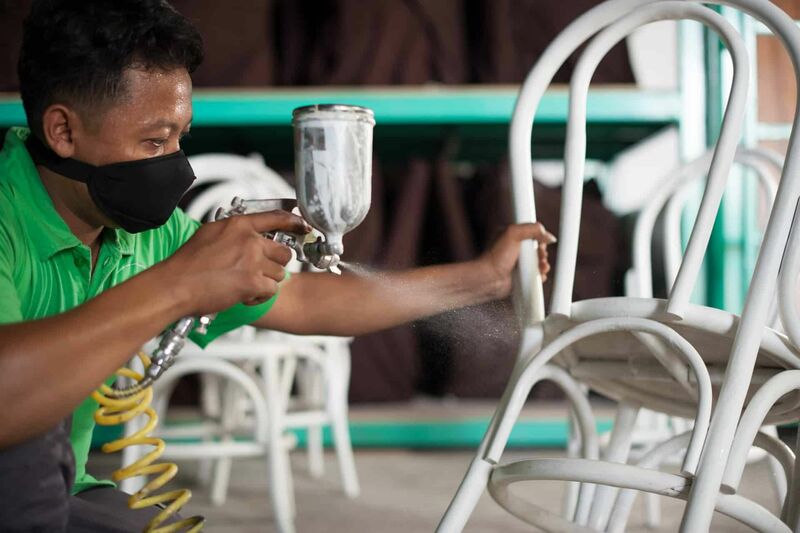 All of your furniture is made in Indonesia, why was this such an important factor for you? Bali is a very special place and the Balinese are truly special people – kind, generous, welcoming and warm. But life can be challenging for many Balinese from a financial perspective and this impacts on their health and family life. 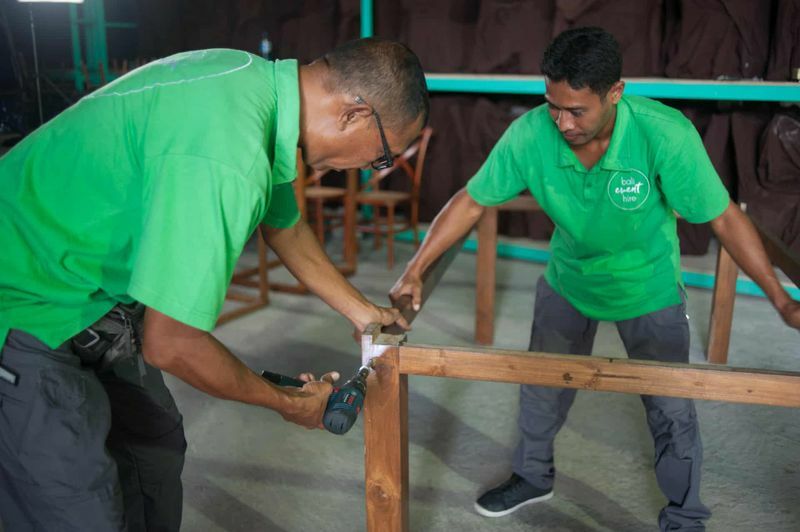 By employing local staff and having all of our furniture made here, we’re supporting the local economy and local families in our own small way. It might seem silly but we feel our furniture is made with love because its all locally produced so there’s a bit of magic in every chair! What type of furniture do you have? We have over 3,500 pieces of furniture in lots of different styles in our Canggu warehouse. 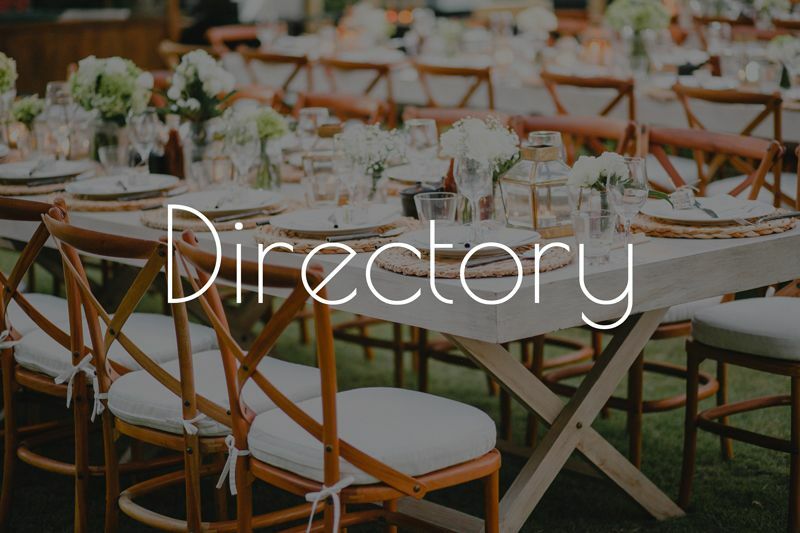 We offer everything from ceremony and reception chairs, Dining Tables, Benches, Arches and Pergolas, a huge range of Cocktail furniture and some beautiful props. You name, we’ve hopefully got it! Tell us a little about your team…. Our team is spectacular, we’re so lucky! 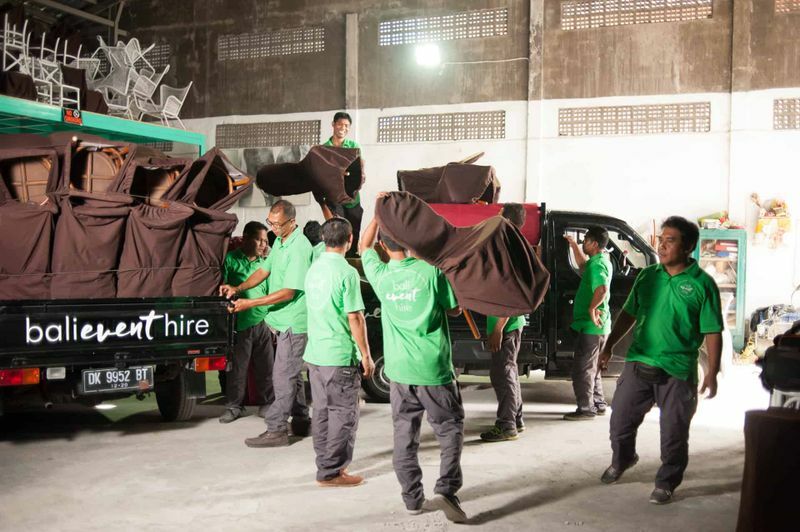 We started with a small team of 4 (who still work for us) and over the past 5 years, we’ve grown a lot and now have a full-time crew of 18 – they’re all local, loyal and happy and very hard-working. All our staff are connected to each other in one way or another and are good friends so there’s a lot of positive team work, lots of laughter and we see lots of funny emojis on our group whatsapps! You’ve just opened the doors to a brand new showroom, tell us a bit about this and why it was necessary? Who can visit your showroom? Sarah and I have been dreaming about a Showroom for years and it’s finally here! We’ve always understood how challenging it can be to plan a destination wedding, particularly when you can’t see and touch some of the key elements like furniture and flowers and glassware etc… We wanted to create a beautiful space that Bali brides can visit with their finance, mum or best friend to get inspired and also to have peace of mind – our furniture is real, the quality is excellent and it’s going to turn up on time on your big day! Our space is open daily from Monday – Saturday and we’re also extending the space to florists or weddings planners who might like to do a table mock up for their brides – so each bride can really see what everything is going to look on the night. Come and visit us! When meeting both of you 4 years ago and Bali Event Hire was in its first year, what is the most important lesson you’ve learnt? So many lessons! Firstly, never lose your sense of humour – there are daily cultural challenges and you need to roll with them, a solution can always be found! Treat your staff like the precious diamonds they are and they will look after you forever! Your 2018 look book has also just come out, how important is it to keep developing new collections? So important! Every bride has a unique vision and wants their wedding to be stamped with individuality. This can only be achieved if we, at BEH continue to offer fresh products and new ways of styling them. Sarah and I love this part of our job. 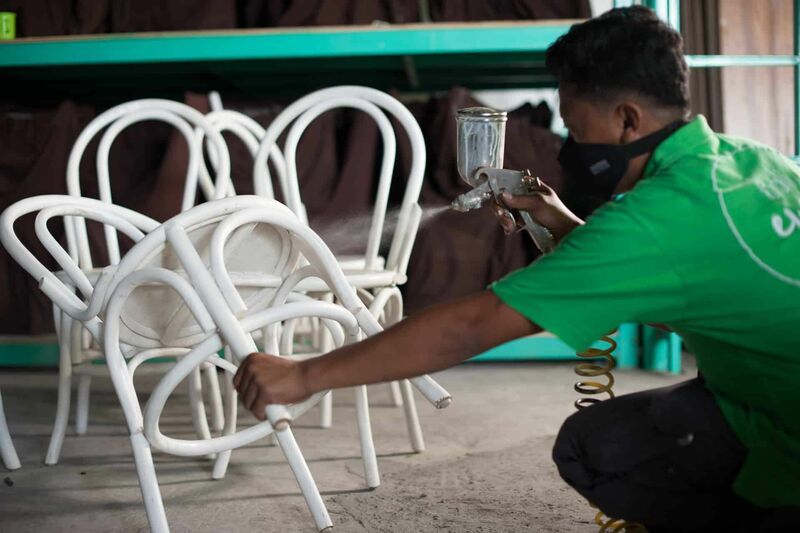 We have a genuine passion for beautiful wedding furniture and we spend countless hours talking about what we can do next, make next, change next – we’re always moving forward and following international trends. We hope this is why we’re successful, we never slow down and we’re always searching for the next big thing. We consider ourselves incredibly lucky. Just last week, at a spectacular photoshoot in Uluwatu – Sarah and I had one of those moments – we looked around and just couldn’t believe how lucky we were to have this amazing dream job! Don’t get me wrong, we work very, very hard but the rewards are huge. We get to be creative daily and work with beautiful couples and clients on this magical island. Frangipani trees, cliff tops and rice paddies are often our office and at the heart of everything there’s so much love in our job. Couples in love, families sharing their love, love for our clients and fellow vendors and a huge amount of love and appreciation of beautiful Bali and our incredible team who make everything happen, and always with a smile.Our Mantra – Yoga and Margarita’s fix almost anything ! 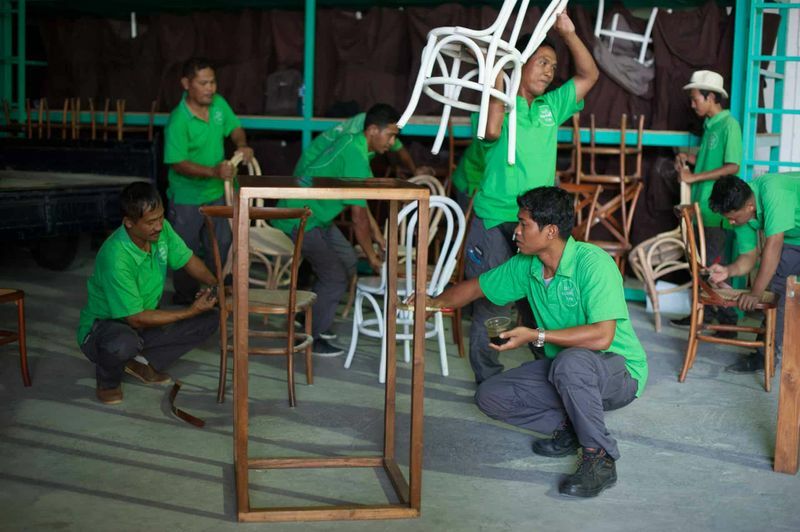 You can see more from the Bali Event Hire team HERE!